In the proposal world, it is not often there is a new invention turned necessity. That’s why when Box Sock was introduced to us we fell head over heels for this must have accessory. Created by the girls who plan proposals for a living (The Yes Girls), the Box Sock was a solution to a common issue guys have – how to hide an engagement ring box? “A ring box in a jacket or a loose ring in a pant leg is a dead giveaway (and quite the stressor), so we wanted to come up with a creative, unique and quality solution for our clients,” Vaughn, founder of The Yes Girls and now Box Sock, stated. The Box Sock is the perfect solution. With its tiny but mighty pocket on the side of it, it gets rid of the possibility of a ring box sighting in their pant pockets. Also, it has the perfect companion slim ring box to conceal. 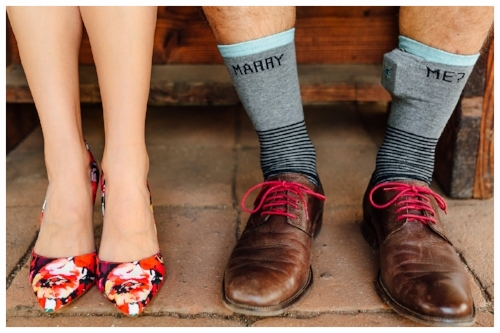 The socks come in many different fun patterns, our favorite being the “Marry Me” ones! They are engineered perfectly to conceal and protect the precious ring. 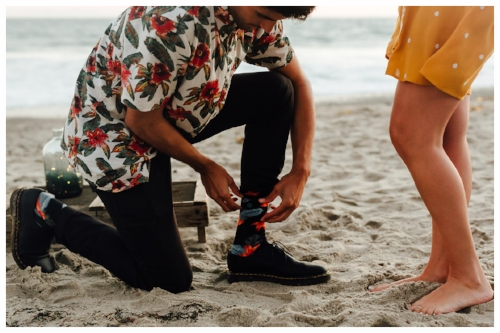 Also, Box Sock helps make a seamless process to pull out the ring once he is down on one knee since the pocket is on the left foot – giving an easy transition to reach down pull out the slim ring box and pop the question. To find out more about this ingenious proposal solution, check out theboxsock.com.